Sustainable Economic Development: Resources, Environment, and Institutions presents 25 articles that lay the foundations of sustainable development in a way that facilitates effective policy design. The editors mix broad thematic papers with focused micro-papers, balancing theories with policy designs. 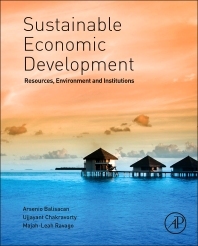 The book begins with two sections on sustainable development principles and practice and on specific settings where sustainable development is practiced. Two more sections illuminate institutions, governance, and political economy. Additional sections cover sustainable development and agriculture, and risk and economic security, including disaster management. This rich source of information should appeal to any institution involved in development work, and to development practitioners grappling with an array of difficult on-the-ground developmental challenges. Upper-division undergraduates, graduate students, and professionals worldwide working on risk, resource, and policy issues concerned with sustainable development. 3.3 Sustainable Development: What Is It Anyway? Chapter 23. Have Natural Disasters Become Deadlier? 24.4 What Has Been Happening to Poverty in Recent Years? Arsenio Balisacan is a Professor of Economics at the UP School of Economics (on secondment) and Secretary of Socioeconomic Planning in the Cabinet of President Benigno S. Aquino III, Republic of the Philippines. Ujjayant Chakravorty is Professor of Economics at Tufts University and Fellow at the Toulouse School of Economics and CESifo. Majah-Leah V. Ravago is Assistant Professor and currently Director for Research at the UP School of Economics.